A credit card USB is a great alternative to the traditional USB stick. With its larger print area, it can allow you as a brand or business, to become more creative, especially if you want to display something other than a brand logo or are focusing on a specific campaign. Add a digital dimension to your business networking. 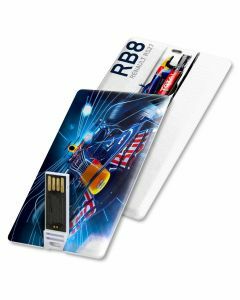 Available in a circle, square and rectangle shape, our USB cards are so thin and the same size as a credit card that you can easily slip one into the pocket of your wallet or purse. 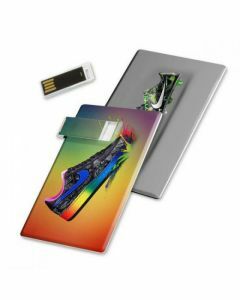 This is a more secure way for you to keep any information stored, safe and ready to hand, with the USB connector flipping out when ready to use. There is no compromise on memory storage either, with cards available in sizes that start from 128 Mb and go right up to 64Gb. Store brochures, presentations and even movies. 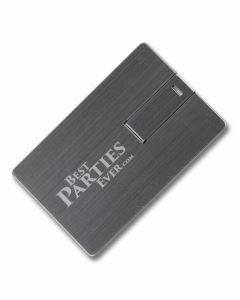 Credit card USBs in a brushed aluminium finish — we can still print and laser engrave your logo on metal. If you don’t like the sound of having the USB connector attached to a card then you will like our Slider card. Slightly thicker than our other cards, but still able to fit in your wallet or purse, the USB connector slides out of the usual card slot and detaches. 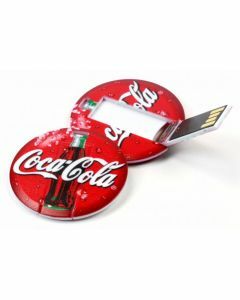 You can also order pin badge attachments or lanyards, (pin badge attachments for circle and rectangle cards only and lanyards for rectangle cards only), with your USB cards — useful for trade shows and exhibitions to enhance brand promotion and avoid misplacement. Let us know upon order of your cards whether you would like us to supply you with either of these options.